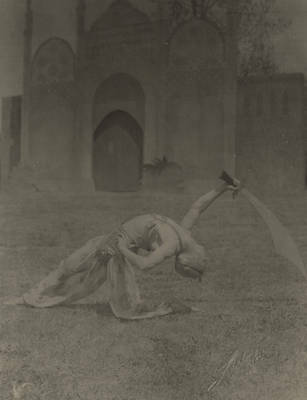 Meryl Griffith plays Mahmud for the 1926 May Fete. Posing with a large sword, Mahmud's Whirlwind Sword, Griffith is in front of a large palace background. The May Fete was a modest production from 1909-1916 until Nell Martindale took over as head and expanded the small show into a spectacular dance-drama. From 1917 to 1927, May Fete saw elaborate sets and as many as 500 performers. The last May Fete was in 1927 when Martindale resigned to be married.